Introduce it to your family! Let me know how it goes! Heat up a large pot on the stove, and add in a couple tablespoons of broth. 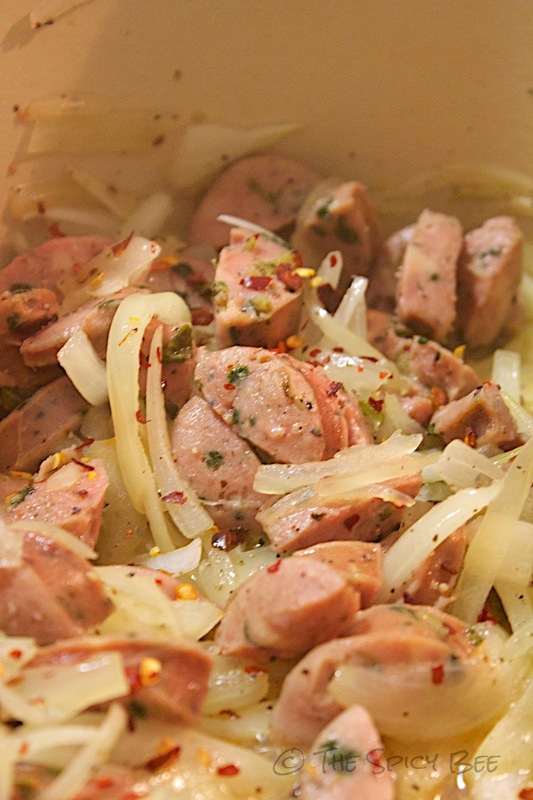 Throw in your sliced sausage and cook until browned, 8-10 minutes. Next, add the chopped onion, as well as a healthy bit of chili flakes, salt and pepper. Feel free to continue to add broth to the pot to keep the onions from sticking as they cook. Cook until the onions are translucent–approximately 10 minutes. While your onions are cooking, clean your beans and place them in a bowl. Collect about 1/3 of your beans into a blender with a few more tablespoons of broth and blend until smooth. This trick will make your soup broth milkier in consistency and add additional lovely flavor notes. Once your onions are cooked, add in the rest of the broth and bring to a boil, making sure to scrape at the pan to remove any burned on bits. 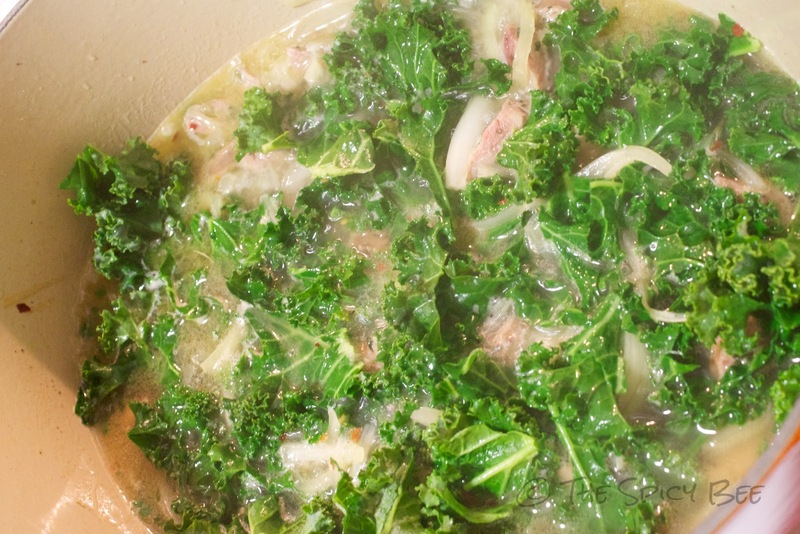 Add in the kale, bring down to a simmer and cover–cook for about 5 minutes or until the kale is wilted to your liking. 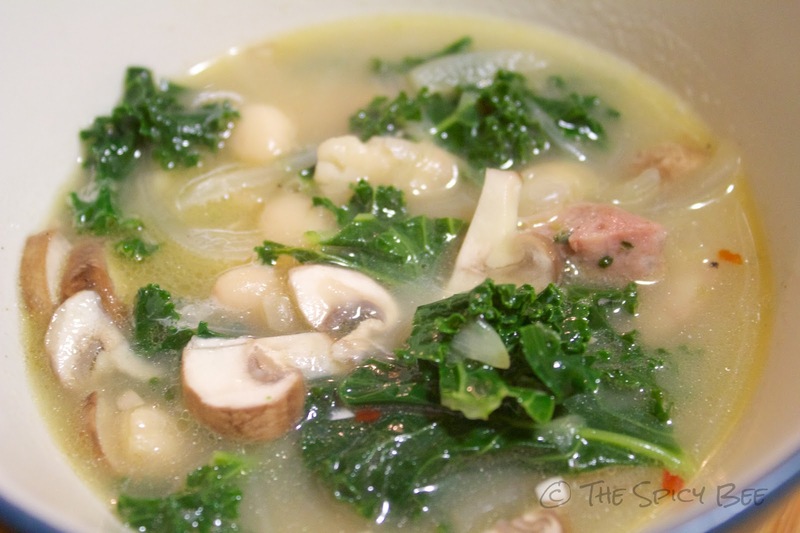 Once there, toss in whats left of your bean bowl and the mushrooms and stir. Test for flavor and heat until the beans are cooked through–perhaps 5 minutes more. Serve hot! (Serves 4). 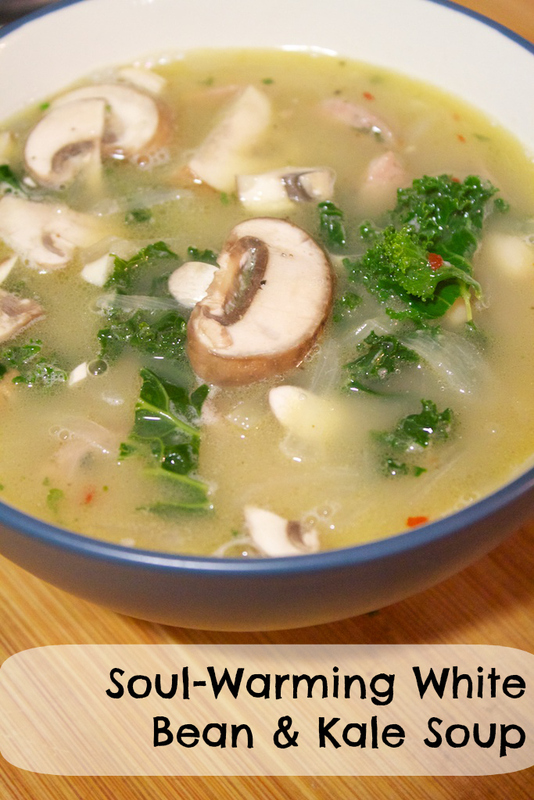 What’s your favorite comfort soup? I’ve been missing kale in my life. I have to make this! Maybe next week! Oh goodness this looks and sounds heavenly! So making this soup this week!!! I love Kale sooooo much. It is one of my favs. Love the new comment set up and super cool sharing tool! looks so simple and delish! PS. Jenni is right, that sharing tool is awesome. That soup looks amazing! I’m going to have to try it!